October | 2013 | GUNNY.G: COCKED AND LOCKED ~ ONCE A BLOGGER ALWAYS A BLOGGER ! JB Williams — Is Being a Communist an Impeachable Offense? Barack Obama is not the Emperor Without Clothes; he’s a president in a skirt. Nor is Obama, in effect the real President of the U.S. Without even a single vote cast her way, Valerie Jarrett is. From a well-hidden lair somewhere in the White House, Senior Advisor to the President Valerie Jarrett builds the figurative bombs that Obama later throws at America. Tied to a Teleprompter and instructed what to say, Obama only ventures out to speak mainly to captive audiences of high school and university students, easily impressed from having been spoon-fed the indoctrination of anti-American Marxism in their classrooms. Only those who cheer him on in canned applause for later media sound bites are allowed wherever Obama speaks. San Antonio, Texas Mayor Julián Castro is currently negotiating with the United Nations to designate the Alamo as a UN Educational, Scientific and Cultural Organization (UNESCO) World Heritage Site, meaning that a blue UN flag may fly above the historic shrine of liberty once it falls under UN control. If the Obamacare rollout had been a success, the Dems would be gloating and saying, “See? I told ya so.” They’d be talking about how they had immense opposition from the racists in the tea party, but after a long fight, they were victorious. And now, thanks to their tenacity, everyone has access to free healthcare insurance, and everyone’s fitter, happier and more productive as a result. That may have been their pipe dream, but that certainly didn’t come true. The rollout has been such a disaster, such a waste of money, that Congress is subpoenaing those who were involved with the administering of the rollout. We want to know what went wrong. Why was this rollout such a disaster? And what’s the deal with the website? Who deserves the credit for the high division / low morale that hovers over our country like a dark cloud? A once proud and hopeful nation is now fractured and frustrated. We are a people mired in doubt and uncertainty. The \”Battle of Lexington,\” 1775, was portrayed as an unprovoked slaughter of colonists by the British. James Perloff believes that, like the sinking of the USS Maine, the sinking of the Lusitania, and 9-11, the event was engineered to start war. It seems Americans have been manipulated into fighting wars from the get-go. WASHINGTON – When the media first learned of the shooting of Trayvon Martin, they salivated at the supposed narrative: White man profiles and kills unarmed African-American boy with handgun. For several years now, many of us have been wondering who will stop the anti-American, anti-freedom, lawless Barack Obama (or whatever his name is), his administration and the commie weasels in Congress. As we watch the in-your-face criminal actions of Obama and his minions (the list of which seems interminable), it is clear that members of the other two co-equal branches of the federal government are either in agreement with him or are too scared of the shadowy powers behind Obama to lift a finger against him. Alex’s take on the new Captain America film in which Captain America battles the shadow government that is staging attacks to convince the American people to give up their liberties. Ice cubes could be a thing of the past after the invention of a new gadget that can chill drinks in a matter of seconds. It’s as if the Pentagon wants the Marines to dress for surrender. The controversy isn’t over a weapon or a fighting tactic. It is over the design of the hat. 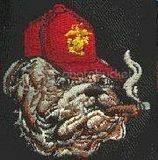 Apparently they want to have a unisex hat for the Marines. Why would they need to redesign the hat if both men and women wear the same design? The new design looks like they are either French police officers or in the French Foreign Legion. They are the stuff of legend. They are not debatable. They were etched in stone. They\’re ironclad. There is no wiggle room. They are the promises, the guarantees, that Barack Obama made to America about Obamacare.